No, there’s been no sewing going on in these parts. And precious little knitting too. It’s all about crochet my dears! 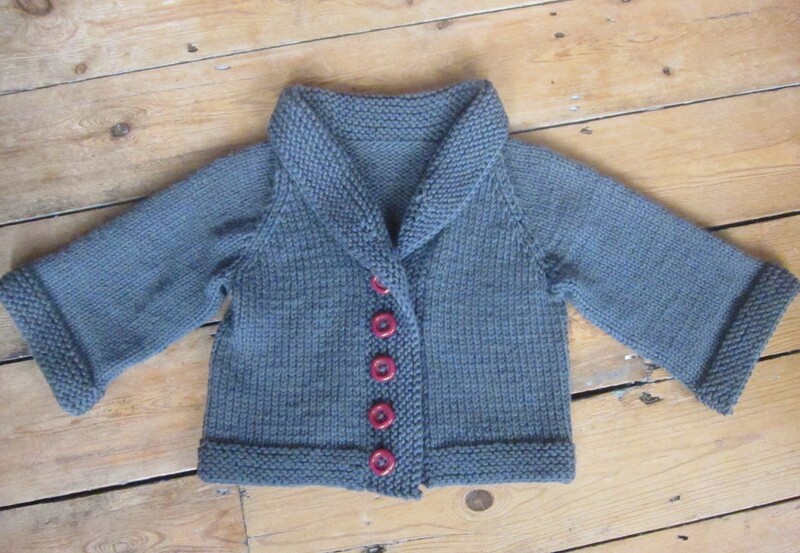 To those who were wondering if I ever finished the Baby Sophisticate cardigan – yes I did and it’s been worn countless times now. Wish I had a pic of it in action but this will have to do. It was fairly straightforward. Used vintage buttons I think I picked up in a second hand shop in Norwich – I love that metrosexual shot of pink in a boy’s cardigan (let’s ignore that they’re a bit leany to the left – dunno what happened there but it’s not obvious when on!). My boy can rock colour you know. He’s got yellow trousers and everything. He gets it from his dad who wore pink shoes on our first date. Make of that what you will. In sewing news… eurgh. I just can’t get round the lack of time and space thing. I’m trying, really.. I’m often to be found sadly pawing through my patterns and fabrics but I don’t take it further. It’s just getting over that hurdle… any tips on making a return to the needle? I’m just about to watch the Great British Sewing Bee on iPlayer so maybe that will galvanise me into action! I tell you what else has got me excited – Tilly’s brand new pattern! Check out Coco – she’s a proper little madam. This entry was posted in Crochet, Knitting and tagged Baby Sophisticate, Coco, Crochet, Knitting, ripple blanket by Joanne. Bookmark the permalink. 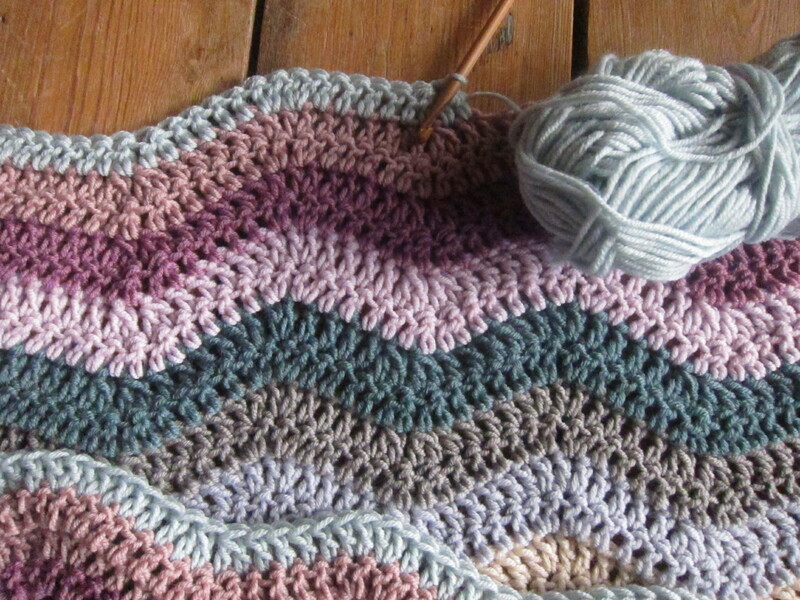 Love those colours in your crochet blanket but, as a crochetphobe, I can’t really believe it’s terribly easy. Good job with the little man’s cardigan – if you can’t rock pink vintage buttons at his age, when can you? To get back into sewing, why don’t you make something you have already made, something you enjoyed making, something that was an easy make? I did that with knitting and now there’s no stopping me – I’ve even turned a heel for the first time in my (long) life. I have to say I’m impressed by you undetaking such a large blanket – I can’t even manage to knit a baby blanket!! Yes that’s exactly it! It’s the cutting and alteration stage I just can’t bring myself to do! All that paper, all that time in front of the mirror… Ack! What a cute cardigan & lovely colours? I dress my wee boy in lots of bright colours too, including pink! I’m with you on the finding time to sew problem & have been thinking I’ll need to start with something I know fits me with no need for alterations, or tracing. Ooh I love a bit of rippling! I’m right into crochet at the minute, it works up quickly and is easy to memorise patterns, so enjoyable. I agree that if you’re thinking about sewing, making something you’ve made successfully before is a good start. I’ve made 3 (still unblogged) things this year, all of which I’d made before. I don’t get much time to sew these days either but when I do I really enjoy it more than ever and actually just enjoy the process so much because I get so little time to do it. I loved your crochet hexagons Kerry. Looking forward to seeing what they look like joined up! Hey three items in two months is great!